First of all, we pray that everyone is safe from Hurricane Florence and that damage to homes and property are minimal to none. Our thoughts and prayers go out to everyone impacted by this storm, and please know that the NC State Extension Cotton Team is willing to help farmers in any way that we can. 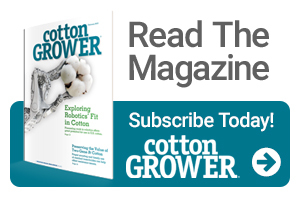 With that said, we wanted to send out some information that may help growers in the weeks to come with regard to evaluating crop damage and management of the cotton crop for the remainder of the season. Preliminary reports indicate cotton crop damage ranging from catastrophic to very little – primarily depending on geography and intensity of hurricane wind and rain – but we will know more as time elapses. Below are some observations from previous experience with hurricanes. Wind Defoliation. The winds from the storm were significant in most areas and have likely defoliated older leaves that were already aging or had experienced some fungal infection from previous prolonged rainfall. Some remaining leaves may begin to turn reddish because of wind injury to the leaves. Some of these leaves may go ahead and defoliate themselves. Based on the experience with the hurricanes in the past, the self-defoliation caused by wind damage is usually not adequate, and defoliants will still need to be applied. In a couple of days, you should be able to evaluate the degree of natural defoliation that will occur by thumping leaves to determine if they have formed an abscission zone. The loss of these leaves may be a good thing, in that it could allow for better airflow and sunlight penetration into the canopy and, therefore, more rapid drying of both open and closed bolls. In these cases, the wind could serve as a preconditioner to defoliation. Fields where leaves were defoliated by wind and remaining leaves are beginning to senesce may be easier to defoliate. Regrowth. Be ready to address regrowth. Cotton that is blown over exposes many of the axial buds that were previously shaded to direct sunlight. Sunlight, along with high soil moisture, will promote rapid and significant regrowth. In more severe cases where fields are flooded, some plants may actually drown, therefore regrowth may not be as big of a problem in these fields. Evaluating your crop on a field-by-field basis may be necessary for defoliation decisions. See our earlier recommendations, where we addressed product selection and regrowth materials now that TDZ seems to be in short supply this year. Seed sprouting. Prolonged wet conditions with warm temperatures can cause seed sprouting in open lint. Usually I start worrying about this when three days of continuous rain occurs, and I can usually find it during day four or five. The slow movement of Florence and her slow exit may put us in this situation. So what does this mean for growers? The more seed that sprout in a given field AND the more time that wet conditions continue, the worse the effects will be. Although our current scenario is much different than that of 2015 when 11 straight days of rain occurred, there still could be some impact from sprouted seed. Hopefully this will only occur in a small proportion of the crop in affected fields. But the percentage of the crop that will be affected is difficult to know at this point and is dependent on weather from this point on. Seed sprouting can result in higher trash content, seed coat fragments and lint discoloration due to staining. Quality losses were substantial when this occurred in 2015. However, during that year, we experienced much more prolonged wet weather than we currently are experiencing. Additionally, if fields are harvested before sprouted seed dry down, this could lead to undesirable moisture in lint and modules, as well as additional discoloration. If an exceptionally high proportion of bolls are affected, ginning could be a challenge because of the difficulty in getting a seed roll at the gin stand. However, this didn’t seem to be as big of a problem as predicted back in 2015. Lastly, this could result in significantly less seed and decreased seed quality once ginned. So what can we do about it? Unfortunately, not much. Dry conditions could stop seed sprouting where it is, and impacts on quality will likely be minimal the sooner that dry conditions come. A day of dry conditions – even a few hours of meaningful lint drying – can drastically change the course of seed sprouting and, therefore, the impact on quality. It is absolutely critical to wait until these germinated seed completely dry out before harvesting these fields. Additionally, it is reasonable to expect that once these fields are harvested, the moisture content of the harvested seed cotton will be higher than normal. It is important to monitor modules for increases in temperature which will lead to further quality concerns and ginning difficulties. Lastly, if fields have already been defoliated, growers could apply a desiccant (such as paraquat or one of the PPO-inhibitor herbicidal defoliants) shortly before harvest to accelerate the drying process. Results could be inconsistent. But if this is the case, it is important to observe label restrictions regarding pre-harvest intervals. Application of desiccants can only buy you a little time through slightly accelerating the drying process. This could be a wasted effort if warm, dry conditions prevail, as waiting a couple of days more before harvesting could provide the same result or outcome. Be careful not to treat too much acreage with paraquat ahead of picking. Paraquat can kill parts of the plants and increase the likelihood of bark in cotton. It is best to harvest cotton within a week of applying paraquat. Lint loss. Opened bolls that experienced heavy winds and rains are naturally prone to falling out onto the ground. In past storms, cotton that was defoliated prior to a storm consistently experienced more lint loss than cotton that had not yet been defoliated (especially those that still had some closed bolls). As far as harvesting wind-damaged cotton, the main thing we will need to do is slow the picker down. If you are having trouble picking cleanly, slow the picker down and see if it improves picking. Picking at speeds where rotation of spindles around the drum matches ground speed can result in cleaner picking. Growers should also read manuals to make sure that lifters are properly adjusted. Immediate loss. This would be cotton blown out on the ground due to the wind. You could collect fallen cotton from several known areas in the field, dry and weigh it. Otherwise you have to collect locks and determine how many bolls per foot of row are lost. It takes about 12 bolls per foot to make a bale. This is not very precise. Evaluating the cotton that remains harvestable may be more accurate than estimating how much was lost. Knowing what is left and weighing that figure against your APH in your particular insurance policy may be the best influence over the “harvest or destroy” decisions at this point. Although there is no real way to predict quality losses, it is safe to assume that some quality loss may have occurred if bolls were open prior to the storm. This will largely be dictated by weather conditions from this point forward, therefore the degree of quality loss is very unpredictable. Residual damage. This would include cotton knocked off by sprayers and cotton that rots or sprouts due to close proximity to the ground. There is no way to predict this damage. If we stay dry and the cotton opens soon, it should straighten up some and minimize this damage. If you have to make an estimate, I would not count on any bolls touching the ground at this point to be harvestable, especially in fields that are flooded with standing water. Growers should contact insurance adjusters to estimate losses in fields with significant damage prior to harvest or crop destruction. Closed bolls. Dry weather and sunshine are the best thing for closed bolls at this point. These bolls remained protected during the storm, but are also prone to rot or hardlock if they are blown over and are in direct contact with other plant material or soil. Small bolls will likely abort at this point, therefore they should not be counted as harvestable. The longer that wet conditions prevail, the more likely closed bolls are to rot. Due to thrashing from the wind, some ethylene buildup is likely already underway in bolls that are fairly close to maturity and therefore will likely open soon. High moisture conditions that occur when these bolls first pop open may result in increased hardlock. Quick defoliation (using a tank mixture that includes a high rate of an ethephon-containing product) as soon as fields are passable may help minimize rotting. However, dry conditions and sunlight at this point will have much more of a favorable impact on closed bolls. Additionally, defoliation can help straighten up lodged plants, further reducing contact of closed bolls with the ground or other plant tissue. Guy Collins is the Extension Cotton Specialist for North Carolina State University. See all author stories here.